Fizz. That’s the sound of a life being saved. I heard it, or should I say, saw it take place on an ad to help save lives. Nothing unusual about that, except it comes from a car manufacturer, Volvo. Nice, if not no surprise, there. Tonight, maybe one more cyclist will be safer, and yet another person may be encouraged to start cycling. Lynx is out. Life is in. Take ‘visibility’ technology, an aerosol can and touch of imagination, the result? Life Paint. I’m looking forward to seeing this practical concept go crazy with some cycling street art. This year is going to be a get wild with people celebrating cycling and life. Nice one, Volvo. *The feature image of the gilet with the reflective ‘B’ does not use LifePaint. As a club, the London and Singapore Baroudeurs put together a gilet that attempts to do a great job protecting it’s rider from the elements, and be seen, happily riding! 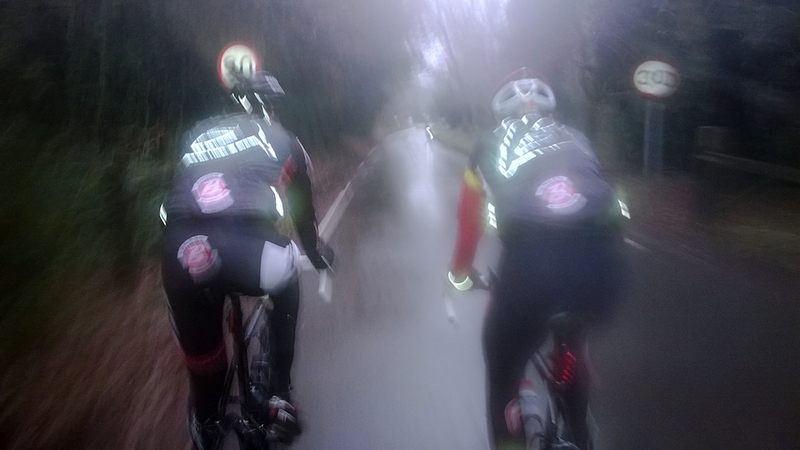 Cold hands + fast riding makes for shaky photos. Nevertheless, a reflective finish makes a big difference to being seen on the roads + good lights.